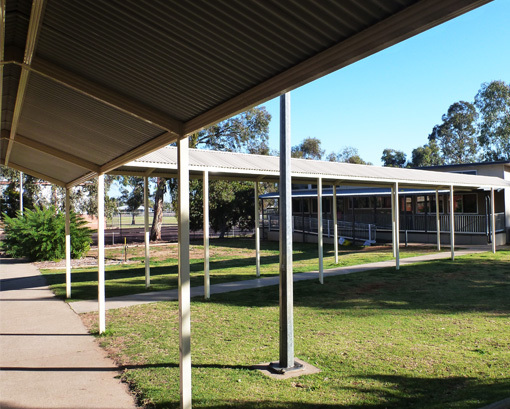 Save your school 15-20% of costs with our customised covered walkway designs and safe efficient methods of construction. Wet days are not only frustrating when you have to keep students inside rather than outdoors playing. The water and mud tracked indoors makes your school look dirty, causes extra cleaning, and can be dangerous. 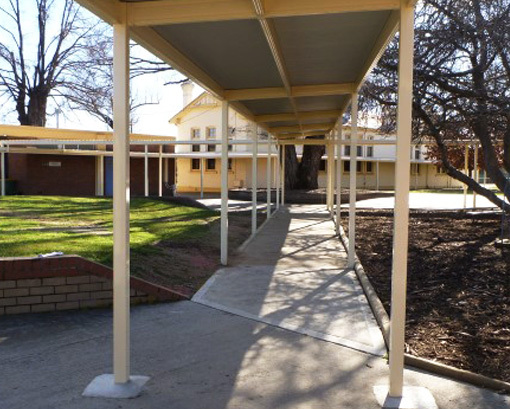 An affordable covered walkway designed to suit your school’s needs decreases wet, muddy shoes on your floors. Save time spent cleaning after rainstorms and decrease slipping accidents with a quick-build project from Asset Building Systems. Who Needs a Covered Walkway? If you have groups of students, patients, or visitors walking between buildings on your property, you need a covered walkway. Let Asset Building Systems design a solution to meet your needs! How Much Does a Covered Walkway Cost? You’re working on a tight school budget. You watch every penny you spend on facilities, supplies, and programs. While a covered walkway may feel like a luxury your school doesn’t need, our affordable design-build process means you can afford to have that luxury while still staying under budget. Our covered walkway projects save schools just like yours 15-20% over other firms. Boost student and faculty morale, decrease cleaning costs, and add a pleasant extra feature to your school for one low price! Contact us today for a free estimate. The construction process is complicated enough. You have to get budget approval, pick a design, and schedule your project during an ideal time in the school calendar. We offer on-site design consultation to ensure the walkway will suit your needs, minimizing the need for redesigns and mid-construction changes. Your project is completed by our experienced construction crew, on time and within budget. Let Asset Building Systems manage your project, start to finish, for one fixed price. Get the finished product you want without the hassle of most construction projects. We design covered walkways to suit your unique needs in curved, gable, or skillion roof types. Extra features such as skylights, lighting under the roof, stormwater connection, and creating a concrete path under the walkway give your project an individual touch at less than the cost of other firms. Offering a free on-site design consultation so we’re sure to meet your needs. We understand you have specific, serious safety concerns regarding your project. Our team has years of experience ensuring the safety of your staff and students, as well as our workers, while maintaining your project’s efficiency. Keep your students, staff, and visitors safe, dry, and comfortable all year long with a quality covered walkway from Asset Building Systems.